Note: If you have any question about how to configure the widget for which you can not find an answer on this page, please ask on the WordPress.org support forum. As it is easy to see, we do monitor and answer questions there. 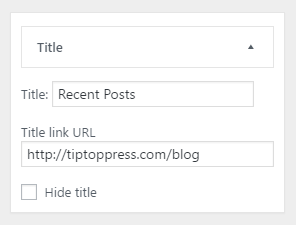 The plugin lets you insert a list of “recent posts” published on a specific category, either as a sidebar widget or in the content with the use of a shortcode. 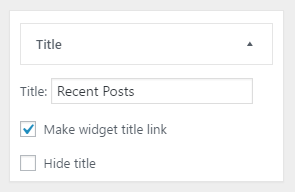 “Recent posts” is a misleading term here, as you can use several types of criteria to decide which posts will be displayed and chronological order is just one of the options. You can control many aspects of how each post item will be displayed. The size and placement of a thumbnail, whether to show excerpt, author, comments number, date information and more. By using the [catposts name="xxxx"] shortcode you can insert a unique widget into any place in a content. The shortcode has the same functionality and configuration options as a “normal” widget. The “name” parameter is optional if you have only one shortcode in the content, but should be specified if you have more than one shortcode. It is used to identify the shortcode both internally and in the customizer. The shortcode [catposts name="xxxx"] can be inserted in any type of content, anywhere. It is basically used to indicated where the widget will be displayed in the content. There can be only one shortcode per post/content, with the same “name”, unless you intentionally want to display the exact same thing in different location. Remove it by deleting the shortcode from the content. Changing the “name” is equivalent to removing the original one and creating a new one. In which you can insert the “name” attribute, but it is not mandatory. When used as a sidebar widget, it is possible to add, remove and configure the widget either through the widget admin page, or via the customizer. When used as a shortcode you can insert the shortcode into any type of content, and then go to the customizer to configure what the short code displays. There are many aspects to the widget you can control including which posts will be displayed in it and some styling to the way they are displayed. If one specific category is selected. The link refer to the specific category page. If ‘All categories’ is selected. The link have to be set manually. Here you can find options to control what is displayed above the widget, AKA as its title. You can either not display a title at all, display some simple text, or display a link to the relevant category page. Title link URL: (This text box appears, if in the Filter panel ‘All categories’ is selected.) 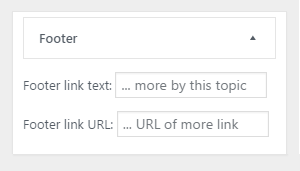 To generate a link you have to put a valide URL in this text box. Hide title: If selected no title will be displayed, no matter what the other options are. Here you can control which posts will be displayed in the widget. You can control their number, their “freshness” and the sort criteria by which they are selected and displayed. Category: The category to which the posts have to be associated with. The special value of “All categories” indicates that all posts should be displayed, no matter which category they are associated with”. Status: Select post with by post status. By default WordPress will not display a future timestamped post until its go-live date rolls around. With the selected option “scheduled” posts will be displayed even if its timestamp is in the future. Other options are “published” and “private”. Start with post: A numeric that can be used to indicated that the widget will not display the post that are the “highest” results of the sorts criteria, but at some offset from the “first” result. A value of 1 indicates that the “first” item should be displayed and then the items “after” it. A value of 2 indicates that the “second” value should be displayed and then the items “after” it, etc. This is useful if you want to have two “latest news” widgets that display the recent post where one displays the N “latest” ones in a different way than the rest. Sort By: The sort criteria used to select which posts out of all the posts associated with the category are actually going to be displayed. It also controls the display order. Reverse sort order (ascending):If selected, the sort order specified in “Sort By” is reversed, “date” sort will show oldest posts first, “Title“ will show lower alphabetical titles first and “Number of comments” will show the posts with the least number of comments first. Here You can control the post detail parts, which appears as part of the post item. All post detail will placed as placeholder. The text in the Template area can be a post details placeholder, text, HTML or HTML for SVG icons. Note: For the SVG-icon HTML we recommend the WordPress Dashicons, which are included as default and can be used without any icon-font including. Note: How it works? and Examples. Select this template: Here we give premade example Templates. Choose one and select it with the button below to take it over. Everything is a link: Each post item, including all its components, is a link to the post. Themes and plugins may override: If set, themes and plugins are “allowed” to make modifications which might result in different excerpt than what is defined by the settings of the widget. Date format: Select the format in which the date will be shown. “Date since published” is the range from post publish date till now. The others are kinds of formats for the date. Show thumbnails above text: If selected the thumbnail will be displayed above the text describing the post, if not selected it will be display to the left of it (on right to left sites, on the right). Thumbnail dimensions (in pixels): You should set here The dimension of the thumbnail in pixels. It is best to set both dimensions but if you set only one the system will try to figure out the other. Blur: The thumbnail image will be blured. Icon: An icon is shown for the default post format. Indicate post format and position: Is a post assigned to a different post format as the default forat, it is indicated with a icon and can be placed at different positions. The “Html without styling” option can be used, if a used Theme has own styles and hasn’t be overridden. Default thumbnail: Select an image to be used as the thumbnail if no thumbnail is configured for the post. The selection process utilizes the internal media library which means that you can either select an already uploaded images or upload a new one. Disable only fonts styles for this widget: (This check box appears, if not ‘Disable the built-in CSS for this widget is checked.’) If selected any style rules for fonts wouldn’t be added by the widget. Footer link text: (Only this text box appears, if in the Filter panel > only one specific category is selected.) If not empty a link to the relevant category page will be displayed in the footer, with the text being used as the anchor text of the link. Footer link URL: (This text box appears, if in the Filter panel > ‘All categories’ is selected.) To generate a link you have to put a valide URL in this text box. Open panels behaviour: When selected, only the “current” panel in the widget admin is displayed, and when a new one is being opened to be displayed the “current” is being hidden. When not set, the user has explicitly “close” panels. Visual editor button: When selected, the shortcode insertion button in the editor will not be displayed. Did not find what you were looking for? please ask on the wordpress.org support forums form the plugin. As it is easy to see, we do monitor and answer questions there.